Cashless transaction is something which two Class VIII girls from a Belagavi school have found is good for health! According to them, the currency notes that change hands all the time are so unhygienic that it creates health hazards for people. Khushi Angolkar and Prarthana Kulkarni, 8th standard students from Kendriya Vidyalaya No.2, Camp, Belagavi have found that the currency notes kept in the pocket can cause serious health problems all because of the harmful bacteria that they carry. Their research work was presented at National Children's Science Congress(NCSC) Regional Level Competition that was held in Bengaluru recently. Their research also found that for maintaining good health it is safer to do cashless transactions instead. Khushi Angolkar said "It is a common perception among the people that the health problems are caused due to not washing hands before eating. But when I visited the market in Belagavi, I saw street vendors counting currency notes by hands using their saliva. I was shocked at the sight of it and realised that how much dirt currency notes acquire every day since many people use their saliva to count notes. People are unaware that harmful bacteria settle on the notes after the saliva is put on it while counting. Severe health issues might arise when the bacteria go into the human body." 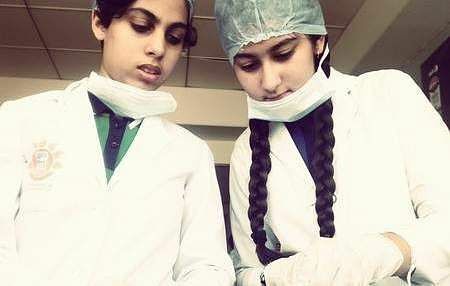 With the support of their class teacher GK Vinaygam and guide Dr Suneel Dodamani, a scientist at Dr Prabhakar Kore basic science research centre, Khushi and Prarthana conducted research for three months from August to October. They had collected a total of 12 notes, two of each denomination randomly from the market. Prarthana said, "We found the notes were contaminated with Pseudomonas and staphylococcus species of bacteria which are infectious. They are carriers of a pathogen and the potential mode of transmission of disease. Lower denomination currency notes had more number of bacterial colonies as compared to higher denominations. One way to prevent transmission of these diseases is by cashless transactions that is using an app-based mode of transaction. Now, we are focusing on creating awareness about our research results widely among people and specially vendors and eventually teach them how to go cashless."